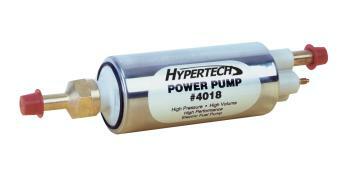 Hypertech Power Pump - Dezod Motorsports Inc - Home of the automotive performance enthusiast since 2002. The Hypertech Power Pump is an externally-mounted electric pump designed to work with stock and slightly modified engines making up to 550 horsepower using a fuel injection system. It is to be used in addition to the stock in-tank pump. It is recommended that engines producing over 550 horsepower should use two pumps. The pressure is not preset and does require a pressure regulator. The flow rate is 162 liters per hour or 42.79 gals with a pressure rating of 125 PSI. This pump is not compatible with methanol or alcohol fuels. It is recommended to mount the electric pump close to the fuel tank and positioned below the fuel level. This assures an adequate fuel supply. It is also recommended that the pump be mounted in rubber, this will cut down on vibration and noise.